The multi-family update had its final public hearing last night. Thirty or so diehards braved the snowstorm to hear public comment about the portion of the proposal that requires streamlined design review (SDR)for all townhouse projects. 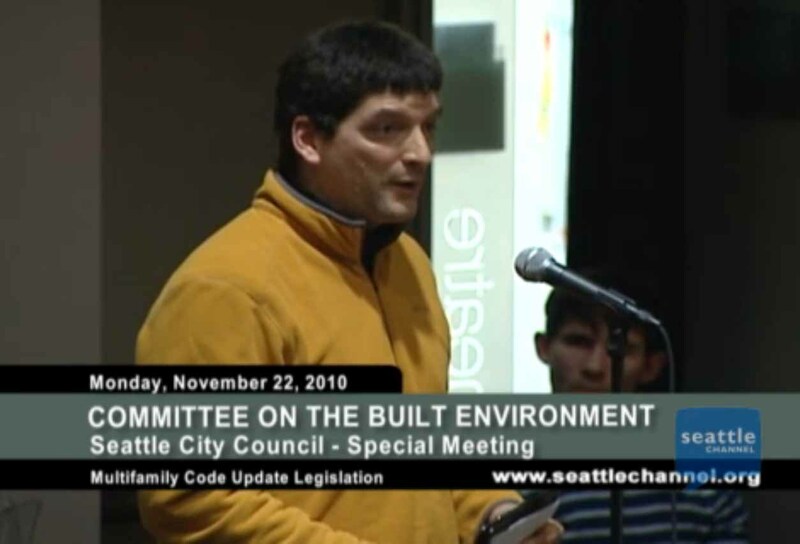 The Seattle Builders Council & Master Builders of King County have come out as supporters of the legislation but voiced strong opposition to portion that requires SDR. The essence of their argument is that financing new development is difficult in this economy & the new SDR process could add enough time, cost and uncertainty to the process that it would shut down townhouse development in Seattle. This process began several years ago because citizens were unhappy with the low quality cookie cutter housing that was inundating their neighborhoods. Developers and architects showed how the existing code was a straight jacket that in many ways mandated these poor outcomes. Citizens wanted early notice and the opportunity to have a public discussion about changes to their neighborhoods. Developers wanted freedom & flexibility to create a variety of types of housing that can respond to a diverse marketplace. SDR is a reasonable compromise between these two competing interests. Developers get a much more flexible code, but they don’t get carte-blanche. It comes with a requirement to show the neighborhood what you’re doing & respond to public comment. Neighborhood groups get their chance for notice & input, but it’s a very streamlined process, with no public hearings, and decisions that are not appealable. Concerns that an understaffed DPD might cause unreasonable delays could be addressed by creating a requirement that if DPD does not meet their review timetable, then the project is automatically approved. Great work on this so far. I agree that Design Review of some kind is warranted for these projects. Therefore I must disagree with the last proposition that delays could result in a free pass. That's a loophole big enough to drive a double wide through. If the MFU becomes the law of the city then the city is obligated to enforce it. One question: I recall that there was a proposal to make the Green Factor requirements applicable to townhouses. Is this still in the picture? Thanks. Yes, Green Factor for all multi-family is part of the new code.